DTB (Draft tube & baffle) Crystallizer | KATSURAGI INDUSTORY CO.,LTD.- Dryers,Drum Flakers,Concentrators,Crystllizers. 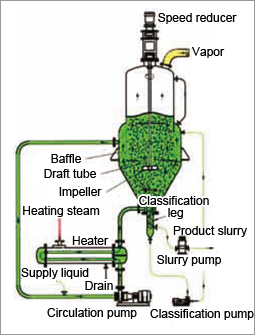 This is a typical model of mixing tank crystallizer. 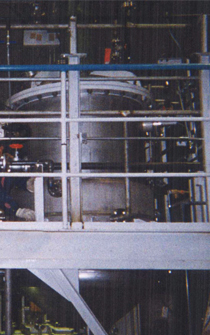 Draft tube is mounted inside, allowing crystals which are growing to be sent efficiently to the evaporation surface with highest supersaturation. When crystals are grown, fine crystals are classified at the classification legs to be extracted. Product particle size is smaller than that produced with the fluidizing layer type, while more stable operation can be achieved compared with the reverse conical type, because crystals constantly contact the impeller which is rotating at high speed. In addition, for small-scaled evaporation concentration, vacuum cooling, or reaction method, no outside circulation is needed, because suspension in the crystallizer is performed by an agitator, which is different from the reverse conical type.